I’ve long been on the hunt for a simple, perfect Caesar dressing. My requirements are: easy to pull together and in-your-face flavor. 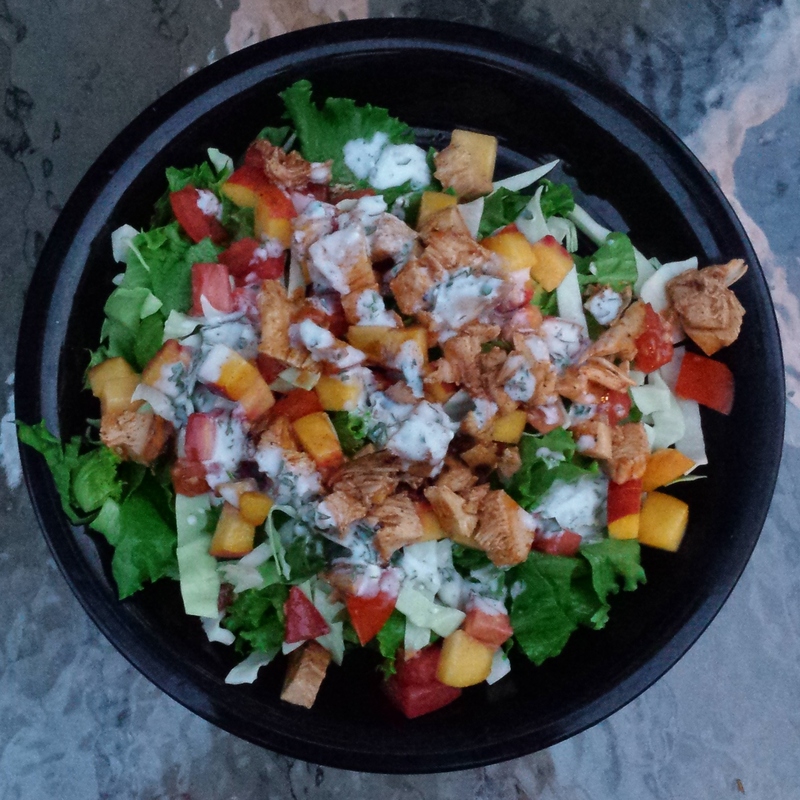 Too many Caesar dressings are creamy, with maybe a bit of pepper to flavor and nothing else. While I’ve made a classic Caesar with raw egg (guided by Alton), it isn’t something you can make a batch of and leave in your fridge (though, it does make for impressive dinner party fare). In my Caesar search I made this vegan version from The First Mess, which is excellent and worth a try. The pine nut parm and roasted chickpeas are full of flavor and wonderful toppings. But all together they take a good amount of work, and involve ingredients I don’t have on hand all the time (in fact, the only reason I have nutritional yeast in my pantry is to make this recipe). Since I’m not vegan, I adopted this flavor profile to fit ingredients I more often have on hand. The result is a simple and intense dressing that you can double or triple easily. 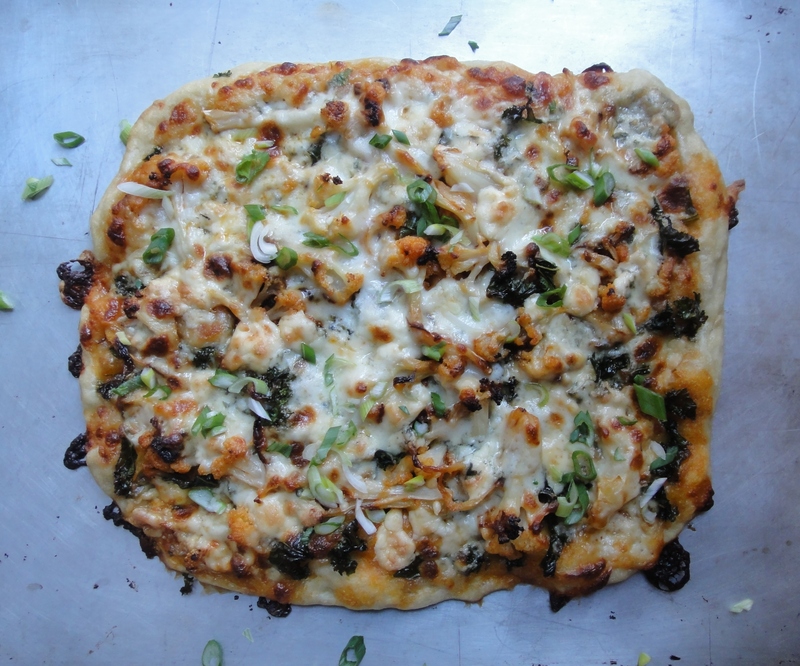 The result is dominated by the flavor of garlic, so if you are sensitive then scale back to smaller or fewer cloves. But it’s worth giving a try at full power – you might be surprised. Instead of the usual romaine (which would still be delicious), I like a mix of kale and cabbage to make more of a slaw as done in The First Mess recipe linked above which is more nutritious than just lettuce and has the added benefit of not getting wilty and watery as leftovers. For a simple side salad you could add grated cheese, croutons, or try the pine nut parm and chickpeas. For a full meal the classic grilled chicken is an easy route, or you could try a vegetarian option. I topped mine with roasted cauliflower and these chickpea burgers for a break from heavier holiday fare. This makes 3/4 of a cup, about enough for 4 meal salads or 6-8 side salads. Whisk all ingredients together in a bowl or put them in a jar and shake it up. Either way: move them about until fully combined. I follow the formula laid out here of 1 vanilla bean for every two ounces of vodka. This year I wanted to make a lot to give out, so I bought two 25 packs of beans, and two handles of vodka. The last few years I’ve used the US Kirkland Vodka from Costco, but any lower to mid-range vodka should work (not the worst, not the best). I use quart mason jars to make the measuring easy – just count fourteen beans for each jar, split them, put them in the jar, and then fill it up to the 28 oz line. A handle of vodka (750 mL) is just under 60 ounces, so that would fill two 28 oz mason and make about fourteen 4 oz bottles. This year I put fourteen beans in three quart jars and filled them, so I had about a half handle of vodka leftover from the two. I’ll use that to make a second batch with doubled-up used beans after Christmas that I can use myself. I have eight beans leftover that I’m saving for other cooking projects, as they are far cheaper bought in bulk like this. The shortest amount of time I’ve let them sit before gifting is five weeks, but longer is better. Order beans and vodka now, put them to steep, and by the holidays you will be all ready. How is that for lazy gift making? Past years I’ve bought twelve packs of Boston round bottles which are economical and just the right size, but I’ve found they leak a bit so I’m searching for a better sealed option. I like to check up on them and give the bottles a shake every few weeks, but that is mostly just for fun and observing the process. The change in color is dramatic, especially after the first few days. I took these photos just two days after I started my jars and look at the difference already! So many gifts and celebrations around the holidays focus on rich foods and sweets. I like giving something that can help create decadence later on, but does not need to be consumed on top of the already collected mountain of extravagance. Someone can tuck it away in a cabinet and maybe not use it for months without the quality or usefulness being compromised. Start a batch now, and you can take care of your giving list before Halloween! Why aren’t we all making peanut sauce? Every day? To put on everything? These are big and important questions. Many a meal can be made from peanut sauce. It takes any combination of rice or noodles with vegetables and unites them into dinner. Or in this instance, takes a collection of vegetables and herbs from the garden/crisper, rolled up in rice paper skins, from a dry, protein lacking appetizer to a legitimate, hot weather dinner option (at least in these parts). 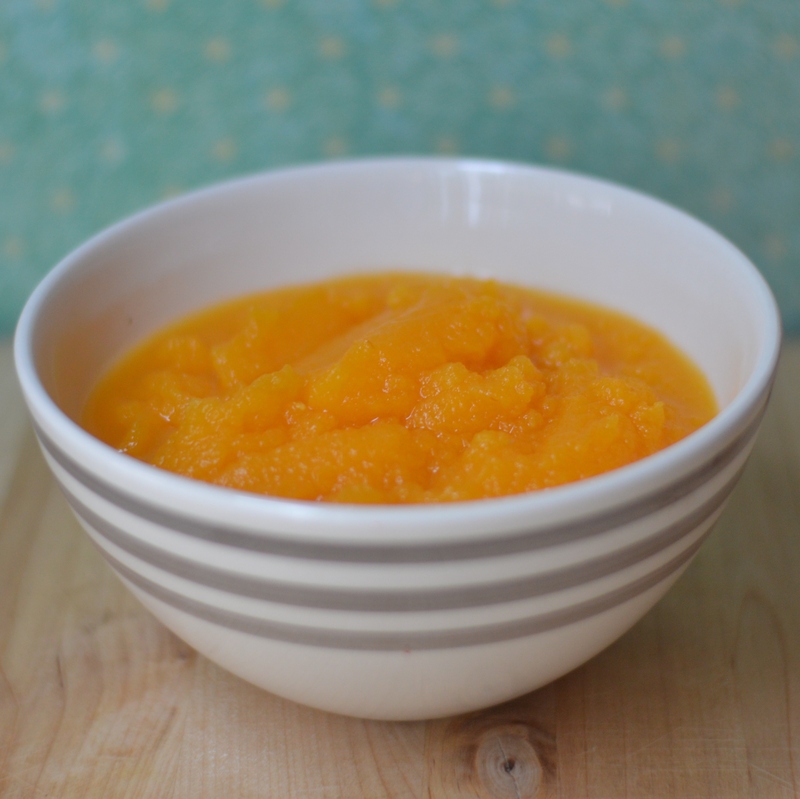 This sauce is vegan, comes together quickly, freezes well, and can be easily adapted. It is mildly spicy on purpose, and I usually serve hot sauce alongside so people can increase heat at will. It is worth making a double or triple batch to stash in the freezer for dinner emergencies during heat waves. Adapted from Sprouted Kitchen. This makes enough for 2 meals to each feed 4. I usually freeze half because frozen peanut sauce at the ready is money in the bank. Heat the oil over medium heat in a saucepan. Add the garlic and ginger, and saute a minute or two, until they are just fragrant. Add the other ingredients except the lime juice and whisk to combine (it may take a couple minutes for the peanut butter to loosed up and integrate). Simmer for 10 minutes and remove from the heat. Add the lime juice and whisk to combine. If you like a really smooth sauce, put it in a blender or food processor for a minute. Collards get a bad rep. They are a vegetable that most consider married to one dish, and if that’s not a dish they cook, they don’t eat them. But I happen to know that collards are not married, or in a relationship of any kind. They are single as can be, and very experimental. Willing to partake in any meal of the day, and mix with a variety of ingredients. This is my first year growing collards, and they’ve sprung up like weeds (even quicker than the kale!). If you want to make collards into a full meal, try them with peanut butter (really, it makes a quick peanut sauce!). Or make them into a salad (or try them in place of kale in any other salad). Or this cobbler I just discovered and will have to try soon. I’ve made this crostini for a couple parties recently, which is easy to transport, quick to assemble, and just another way to eat whipped feta. The leftovers have been enjoyed with scrambled eggs for breakfast. See – collards are great! And versatile. Grow them, eat them, love them. People eating this appetizer won’t even realize they’re collards with all their predetermined baggage, and will fall in love with them too. Which is okay, because collards play the field. Remove the stems from the collards and chop the leaves into bite sized pieces. 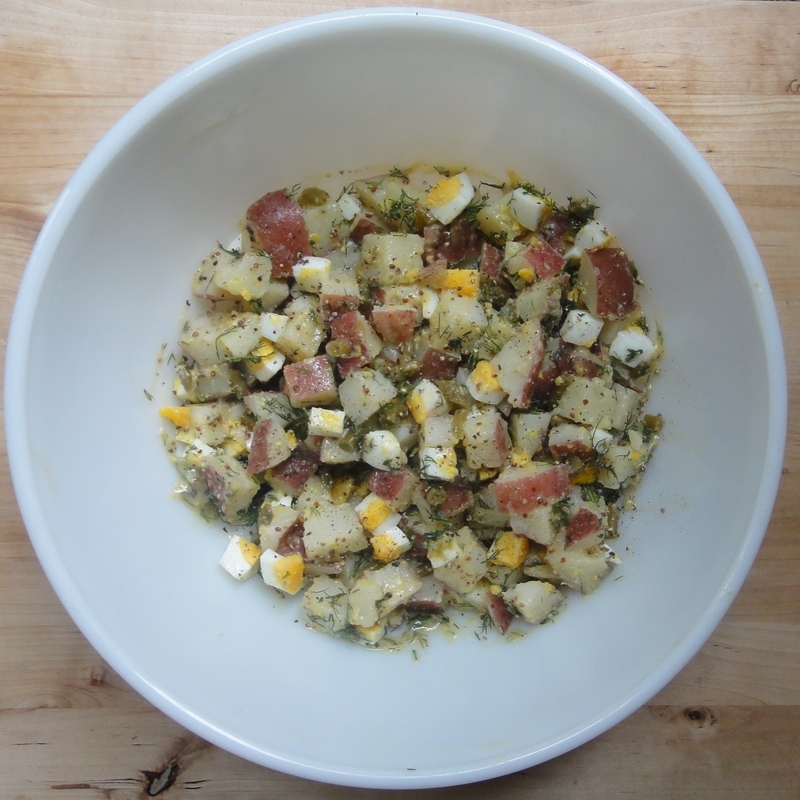 Put the feta and cream cheese in a bowl of a food processor. Turn on the blade for a few seconds to combine, then pour in the 1/3 cup of olive oil. Process until smooth and uniformly combined. In a large saute pan that has a cover, heat the 3 tablespoons of olive oil over medium heat. Add the whole, peeled garlic clove and allow it to brown slightly in the oil, flipping a few times so it doesn’t burn. When it is golden, remove the garlic clove and add the collards. Cover, and cook for 2 minutes. Remove the cover, toss the greens, add the red pepper flakes, and continue to cook for a few minutes more uncovered until the extra liquid has evaporated. When read to serve, slice the bread and toast under a broiler or on a grill. Slather with whipped feta, and top with the greens. It’s a good thing my sausage order didn’t come in this week. I planned on making this orecchiette with sausage and pesto, or maybe my eternal favorite, orecchiette with sausage and broccoli rabe. Without good sausage, neither seemed appealing, so instead I turned to the half a cauliflower in the fridge. Pesto still seemed like a good idea, but I used the perfectly serviceable greens already in the house (kale and parsley) in place of basil. What resulted was the fastest dinner I’ve made all week (exactly 45 minutes). Pasta with nicely charred cauliflower and pesto that hits all the right notes of salt, grassy herbs, and richness from the pine nuts and olive oil. I keep pine nuts in my freezer for when pesto cravings strike (and to make this salad topping – so good! 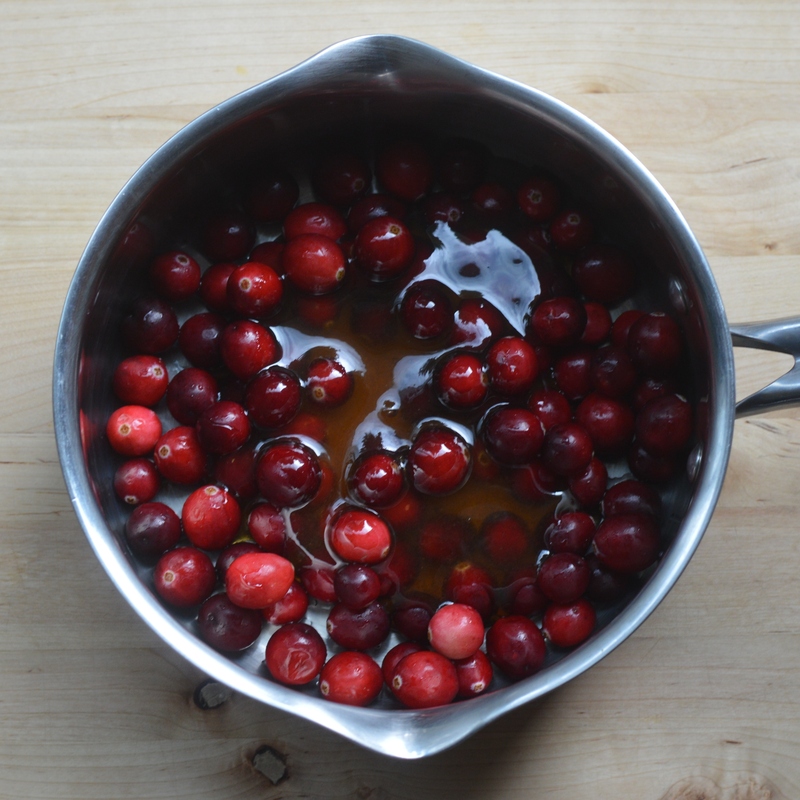 ), and throw them straight from there into the food processor. Serves 6. Inspired by Two Red Bowls, pesto recipe adapted from The Art of Simple Food. Preheat the oven to 425F. 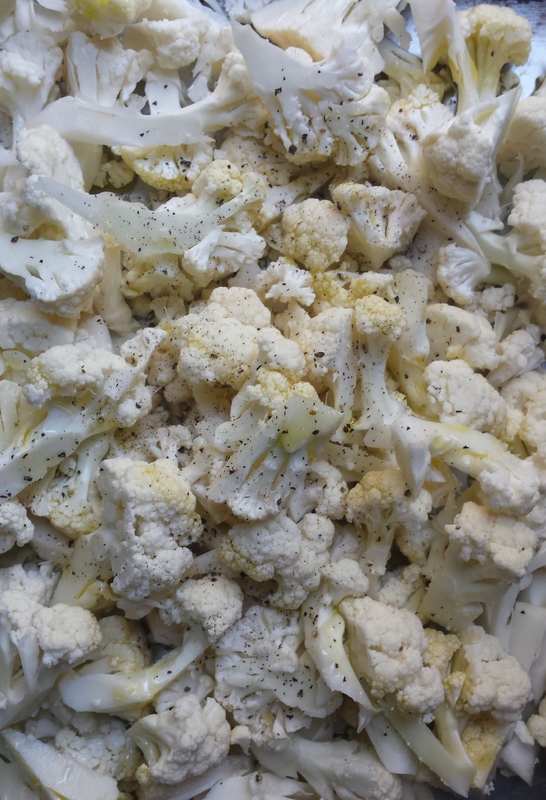 Cut the cauliflower into small florets about the size of your pasta. Toss in 1 tablespoon olive oil with a pinch of salt and pepper, and spread out on 2 baking sheets. This may seem like one extra pan to clean (and it is), but it is needed for truly crisped and not just steamed cauliflower. Roast the cauliflower for 10 minutes, and then toss it. If your pieces are very small check again after 5 minutes. Mine were about an inch long and done after 10 more minutes. When you put the cauliflower in the over, put a large pot of salted water on to boil. While your water is coming up to temp, make your pesto. Using a food processor start the blade running and drop in the garlic. When you stop hearing it bounce around it will be fully chopped. Scrape down the sides of the bowl, then add the salt, kale, parsley, pine nuts, and parmesan cheese. Pulse until they are uniformly combined, then run the machine and stream in the olive oil. Taste and adjust if needed. When your water boils add the pasta and cook according to the directions for your particular shape (or, set the timer for 7 minutes and taste every minute after for done-ness). Before draining the pasta reserve a small cup-full of the water. Drain, then return the pasta to the pot. Add in the roasted cauliflower, pesto, and two tablespoons of the cooking water. Stir to combine, and if it seems a little dry add another tablespoon of water. 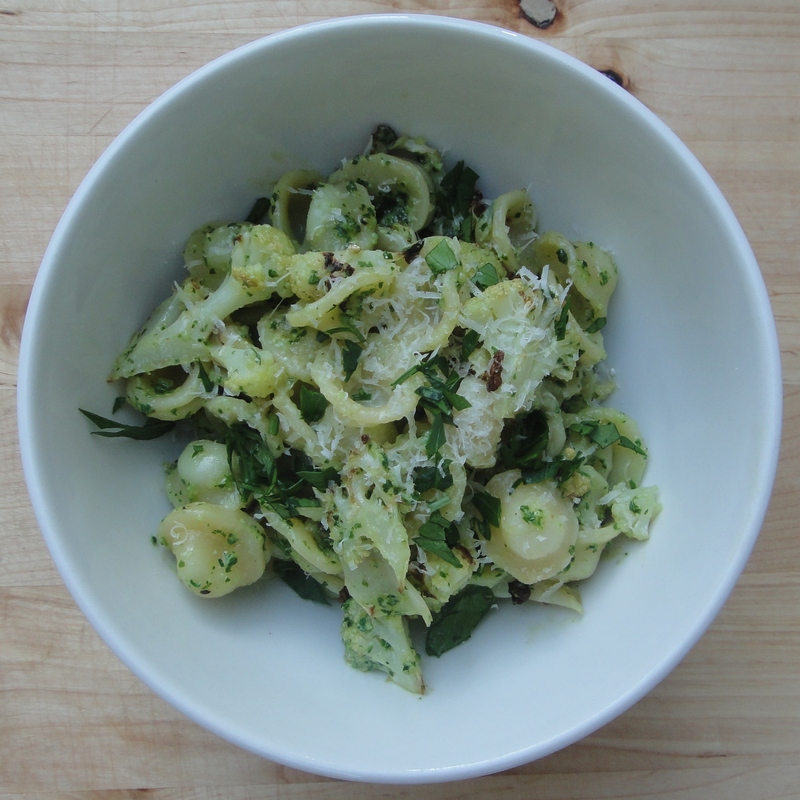 Serve with a bit of extra parm grated on top and a sprinkle of parsley. When I first began cooking in earnest, I watched a lot of the Food Network. Recipes cooked and loved were printed out, inserted into plastic sleeves (so cooking splatters were easily removed), and organized in a binder. Within a few years I shifted more heavily and then completely to blog and cookbook content, and started saving most recipes on Pinterest. Unable to completely let go of that stage in my cooking education, the binder has moved five times with me in the last five years and still holds some recipe gems. This black bean soup was an early addition, but my cooking style has changed enough that the method and ingredients needed an update. This version requires a little more time because it uses dried beans, but is even more economical and tastier because of them. 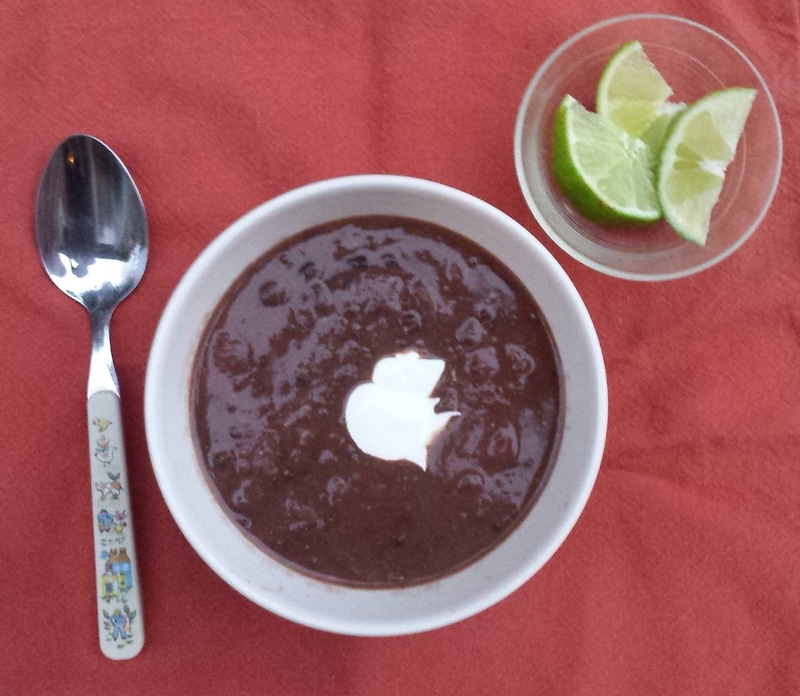 The chipotles make for a smokey undercurrent in this rich tasting but humble soup. Serves 6. Adapted from David Lieberman and Joy the Baker. Put your bacon in a large pot over medium heat. Cook 5-10 minutes, until the fat has rendered out and the bits are starting to crisp. Drain out all but a tablespoon of the fat (save it for cooking!! ), and add in the onion and garlic. Saute for 5 minutes or until the onion becomes translucent. Add in the beans, bay leaf, stock, and water, cover, and bring to a boil. Lower the heat to a simmer and cook for 45 minutes. After 45 minutes check your beans – they should be close to done. If they still have some crunch let them cook for another few minutes. When they are tender add the canned tomatoes, Worcestershire sauce, tomato paste, chipotles en adobo (1 makes for a nice smoky flavor, 2 for heat), and salt. Stir to combine and simmer uncovered for 30 minutes. You can serve the soup as is, partially pureed, or entirely pureed (use a potato masher, stick blender, or spoon part/all of the soup into an upright blender). I go in the middle, so the soup is thickened a bit but there are still whole beans and tomato. Stir the sour cream and lime together until uniformly combined. Serve with extra chipotle en adobo or hot sauce, crema, and any crumbs from the bottom of the bag of tortilla chips. 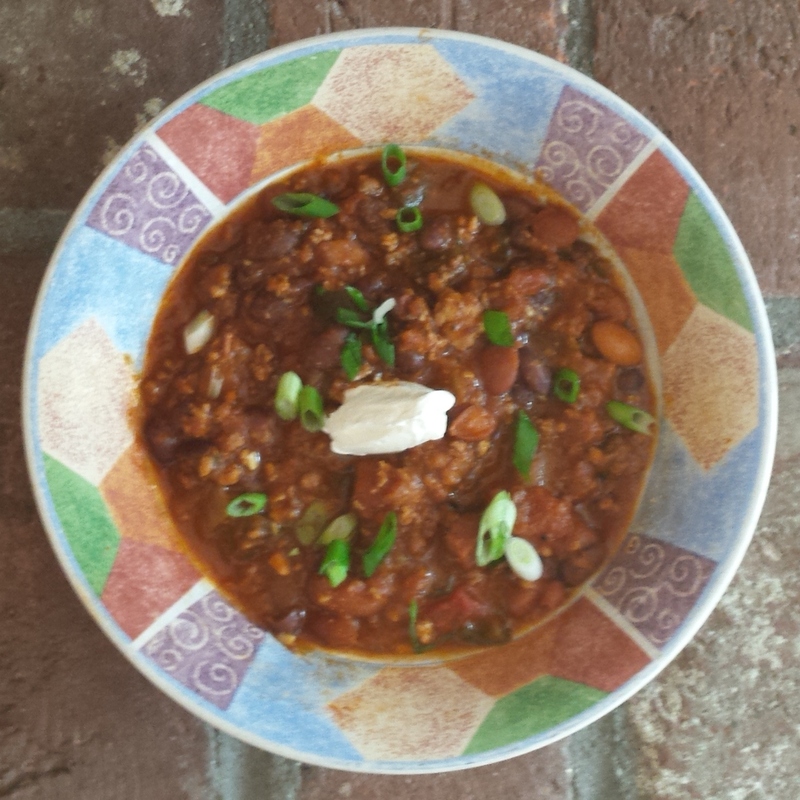 I’ve been honing this recipe for a few years and it is finally at the point where I can call it my ideal chili. The meatiness you expect from chili is balanced with beans, mostly because I love them so much, but also to make it healthier and more economical. (And when you’re using less meat, you can buy the really good stuff.) I realize to some of you the addition of beans disqualifies this as a chili, but I grew up in the Northeast where we put beans in our chili (if we want to) and still call it chili, and sugar in our cornbread. There are multiple heat sources to provide a present but not overwhelming spiciness, and the perfect richness from tomatoes and tomato paste. I’ve made this including everything I could possibly want to be in chili, but that does make for a long ingredient list and some things could certainly stand to be substituted or left out (see head note). Besides a life long love of chili (especially after ski days), I needed to get this in writing because my Dad asked me to teach him how to cook it. We are just about at the point of independence, and this posting should be a nudge to go forth on your own. It’s his favorite chili too, and hopefully will be yours. Serves 8. Adapted from Rachael Ray. This is a flexible recipe. Use any combination of beef, pork/sausage, chicken, or turkey. Or leave them out entirely and double the beans. A bell pepper will do if poblano are not available; red, white, or yellow onion; any combination of black, pinto and kidney beans. If the chipotles were replaced with fresh jalapenos, or the tomato paste or Worcestershire was left out, the world would not end. Dice the onion and poblano. Mince the garlic cloves and chipotle en adobo (but keep them separate). Heat a large pot over medium high and brown the beef and pork while breaking it up with a spoon. When the meat has turned from pink to brown and there are perhaps a few bits sticking to the pot, add in the onion and poblano. Stir to combine, and saute for about 5 minutes, until the onion is becoming translucent and the peppers are softening. Add the garlic, cumin, and chili powder and stir to combine. When you can smell the garlic, add in the chipotle en adobo, tomato paste, Worcestershire sauce, and salt. Stir to combine again, and saute for a couple minutes. Add the beer, and cook for another minute. Add the crushed tomatoes, and then clean out the cans by pouring the beef stock into them, swishing it around, and then pouring the stock into the pot. Add in the beans. Stir to combine everything, and cover. When it starts to bubble, turn the heat to medium low, and simmer uncovered for 1 hour. When the consistency is where you like it (I go for a thicker chili), taste for seasoning and adjust. Serve with sweetened cornbread or tortilla chips, shredded cheese, chopped onion, and sour cream or yogurt. Mac and cheese was my gateway to loving cauliflower. Growing up I only experienced it as a raw vegetable left sad and lonely as the last thing eaten on a crudités platter. But in my quest to revisit vegetables I dismissed in my youth I made Jamie Oliver’s Macaroni and Cauliflower Cheese Bake and never turned back. It’s no revelation that any vegetable in mac and cheese is lovable, but cauliflower is especially so. Will had been flipping through How To Cook Everything: The Basics and bookmarked the Cauliflower Gratin with Bleu Cheese, which intrigued me but I didn’t have other elements to make it into a meal. The Jamie Oliver recipe is delicious, but creme fraiche is more expensive and not an ingredient I always have lying around. Marisa from Food in Jars posted a more basic veg mac and cheese last month that inspired me to work on my own basic mac recipe that I can adapt to whatever is in season or in my fridge. My version has some different steps, including roasting the cauliflower (but if in a rush you could cook it with the pasta like Marisa does). Arugula is not a green I usually have around, and I might have otherwise used kale, chard, or spinach. There was a bit of cheddar sauce leftover from last week’s baked potatoes, and since the new sauce I’m making was essentially the same thing and I didn’t want to let it languish in the fridge I just added it on in. I think with this basic cheese sauce recipe I could make mac and cheese out of just about anything now. Adapted from Food in Jars. Serves 6. Put the water on for the pasta, and start your sauce by melting the butter over medium heat in a small saucepan. When it is starting to bubble, add in the flour and whisk to combine. Continue whisking while the flour and butter cook for about 3 minutes, until it smells a little nutty. Slowly add in the milk, whisking in between additions (or while someone else pours, if you have an extra set of hands).When all the milk is added let it cook over medium heat (or slightly lower if it starts to bubble a lot) for 5 minutes. The sauce should be visibly thicker at this point. Add in the bleu cheese and whisk to combine. Add in the salt and ground pepper and turn off the heat. When your cooking water is boiling, salt it and add in the pasta. Cook until al dente, about 6 minutes. Reserve ½ a cup of cooking water before draining the pasta. Then return the pasta to the pot, add in the roasted cauliflower, the arugula, and the blue cheese sauce and mix it all up. You can stop here and enjoy a stove top mac and cheese with a nice creamy sauce. To bake, grease a 9″x13″ pan and add in the pasta and veg mixture. Top with parmesan cheese and bread crumbs. Bake in your oven (still at 425F from roasting the cauliflower) for 15 minutes. Let cool for a couple minutes then dive in. 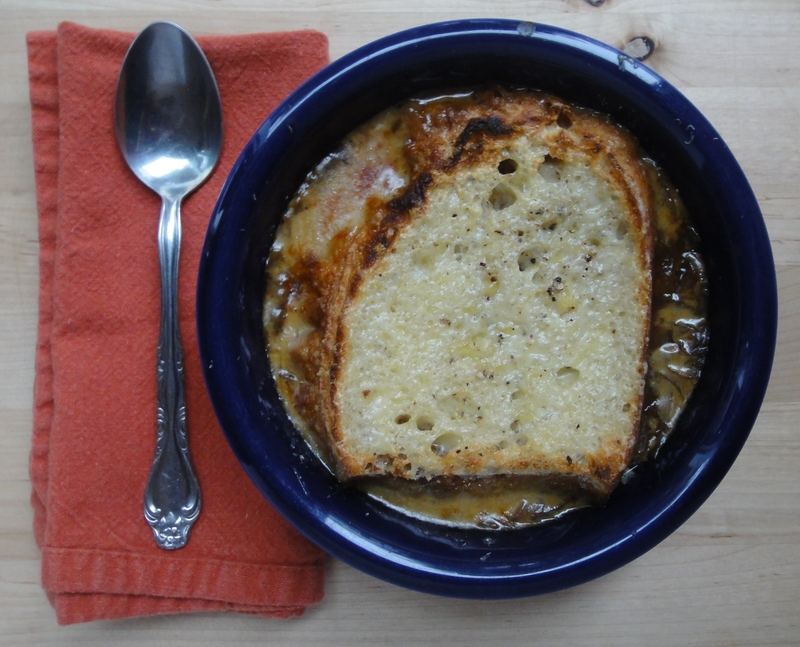 My most recent recipe in the Grafton News is French onion soup. I originally wrote the recipe 5 years and a whole blog ago, but wanted to retest it, write clearer instructions, and take a new photo. I’m living clear across the country and have lived in four apartments since that one, but I’m still using that same chef’s knife. I’m also still greatly in favor of such a simple soup with a crispy, cheesy topper. It would be an excellent one to try out over a long weekend. 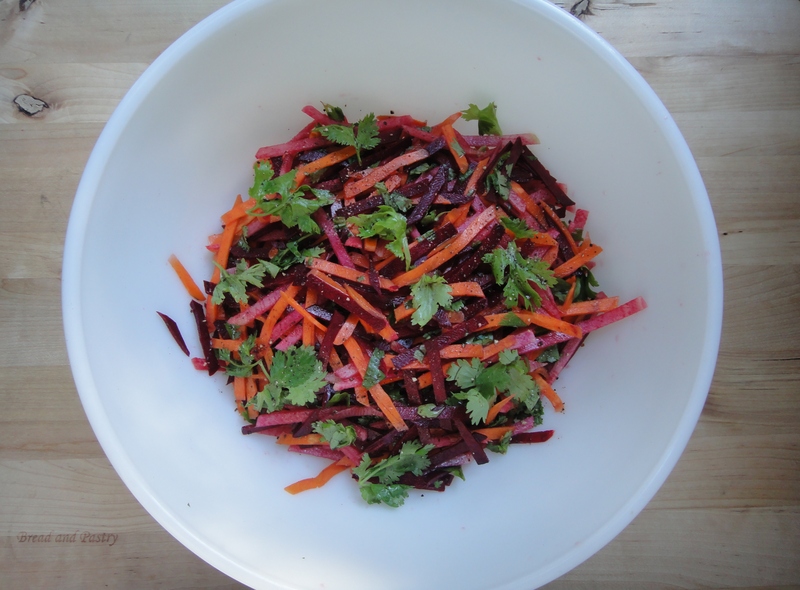 This recipe for a rainbow slaw is in the most recent issue of The Grafton News. It is based off of a recipe in Jerusalem that I’ve simplified. It really holds up well over a few days, and the cold water soak makes for supremely crunchy vegetables. The mild weather does not have me rushing to cook lots of soups and braised things, plus I always crave some vegetables to balance the Christmas cookies so there have been quite a few salads like this in my kitchen recently. 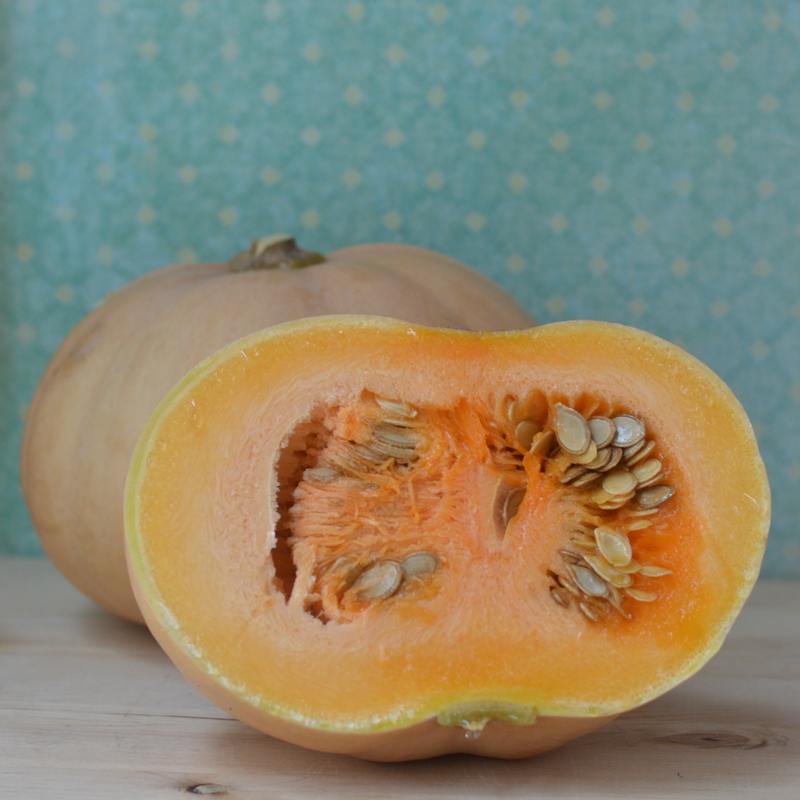 The roots for this recipe came from my favorite nearby farm, so there is still local produce to be found! I’ve made the leap. Now I don’t just have recipes that I published myself on this little website, but also in a little local publication and on their website. 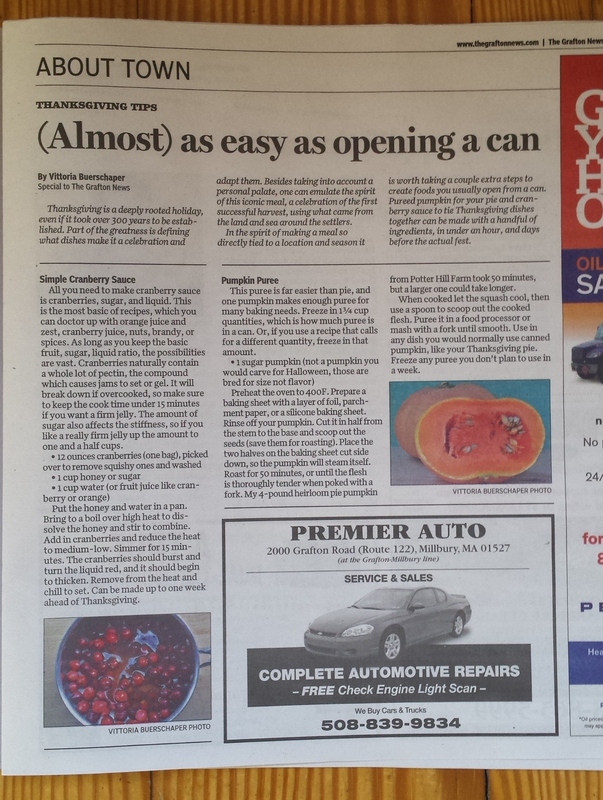 The print edition is just a short intro and the recipes for the most basic of cranberry sauces that you can doctor up, and breaking free from the cylindrical confines of canned pumpkin. The online version has a bit more of a story to it, which you can read here. Rumor has it these may be the first recipes ever published by our town paper. For the tiny portion of you who may reside in the same town in central MA, you can see the article in the November 18th edition of the Grafton News. Today is a great day to make both recipes and start checking things off your Thanksgiving to-cook list. Breakfast is the meal I most often improvise. Some combination of staples are always on hand. The fridge is rarely eggless, there is bread or tortillas, a bit of vegetables and cheese leftover from dinners to work with, and beans if it is an extra good week. On days when something sweet is called for there is yogurt with fruit or jam and granola, pancakes, or oatmeal with apples. I don’t plan out and shop for breakfasts the way I do dinner (except for rare weekend company). I wake up and assess the fridge and make what I can in about 15 minutes (pancakes and oatmeal take a bit more premonition). And when I happen upon a really good combination, and the ingredients are still on hand, there is often repetition. This has been breakfast the last three days in a row, and each morning I’ve been surprised by how ridiculously delicious it is. My love of whipped feta is well documented, topped with creamy scrambled eggs (but not in the eggs, which I find makes them watery), with a little sauteed kale for color, texture, and virtuosity. Good toast is key, and a whole wheat sourdough is the perfect base. This recipe makes enough whipped feta for about 6 toasts, but keeps well and is excellent on toast or crackers alone, sandwiches, pizza…maybe double it. In a food processor or with a hand mixer combine the crumbled feta, cream cheese, and olive oil. Mix until thoroughly combined (shouldn’t take more than a minute or two). Put the bread in a toaster to brown to your liking. Crack both eggs in a bowl and beat with the milk, salt, and pepper until uniformly mixed. In a small pan heat the olive oil or butter over medium heat. Add the kale and water and cover the pan. Allow to cook for 3-4 minutes until the kale is bright green and uniformly shiny. Uncover and turn down the heat to medium low. When the extra water has evaporated and the pan has cooled a bit add in the egg and stir to scramble. Continue stirring until the eggs are solid to your liking. 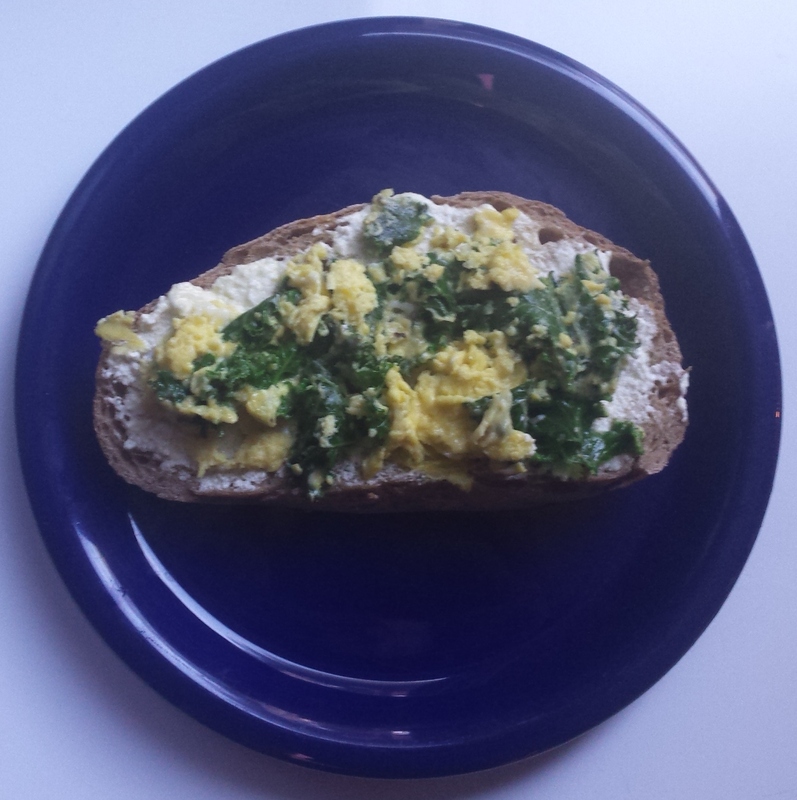 Slather toast with whipped feta and serve with scrambled eggs on top. If we’ve never met, I think I can sum myself up pretty well with this statement: I’m the one who brings a salad to a party. I’m certainly not anti-dessert (hooray for cider doughnut season!!! ), but so often everyone else offers to bring an appetizer or something sweet and there are no vegetables to balance it all out. Kale salad keeps incredibly well, and is in fact better if made ahead so the dressing breaks down the kale a bit. The particulars are not so important here, I really like the apples but a roasted veg like butternut or beets works as well (or could be in addition to the apple), any dried fruit, and whatever nuts you have around. I wanted to make sure there was a diary free offering for our work potluck, but at home I would definitely add crumbled goat cheese on top. 10 oz kale (1 large bunch or about 6 cups), stems removed and chopped. I used a mix of Red Russian and curly green. Put all the dressing ingredients in a jar and shake to combine. Taste and adjust to your liking. A few hours before serving, toss the kale in the dressing. To really get the dressing in the curly bits use clean hands to do the tossing and massage the dressing into the leaves. 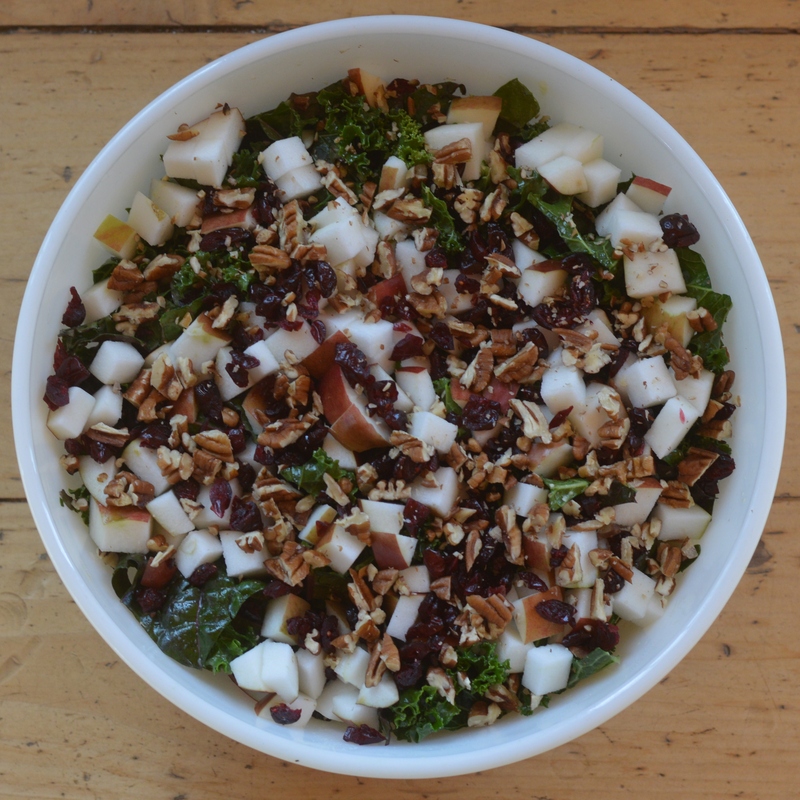 To serve, top with the pieces of apple, pecans, dried cranberries, and goat cheese (if using).